This walk: 2010-12-1. 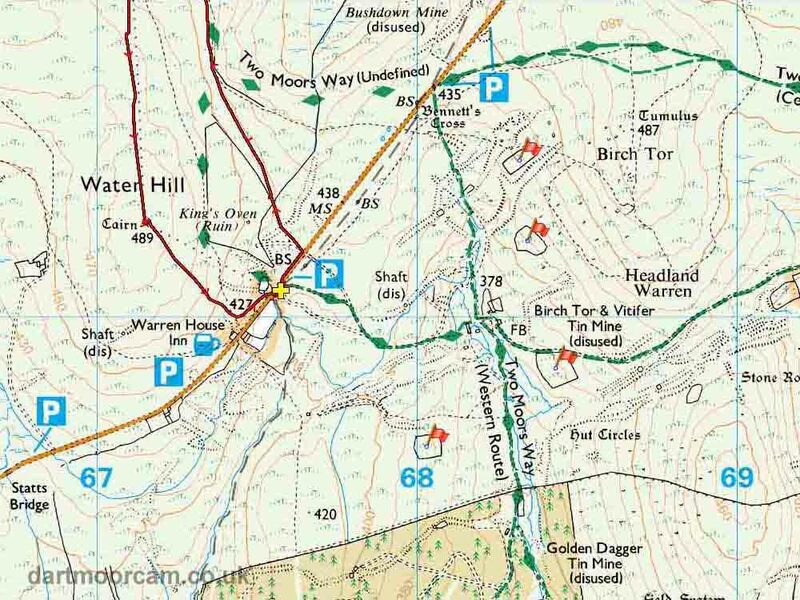 King's Oven car park, Warren House Inn, Fox Moth caterpillar, V-stones, King's Oven, Water Hill, Hurston Ridge, Assycombe Hill, double stone row, Kes Tor, Natty's Castle, Four Aces enclosures. Another walk, misty, 2009-1-28, partly in the same area. The hardiest group of Moor Strollers yet, in the King's Oven car park with the Warren House Inn behind. The outside temperature indicator in our car showed -4 °C, but with weather forecast showing wind speeds gusting to 10 mph, and with the wind chill factor calculated, it felt more like -12 °C ....... cold! Aha - the hardy Dartmoor Fox Moth caterpillar, complete with frost - tougher than some folks we know ..... eh, Jim? Details - Fox Moth caterpillar (common during July-October), up to 8 cm (3 inches) in length. It feeds on heather, bramble and bilberry. It will be fully grown by the autumn and will then hibernate, to emerge next spring to pupate without feeding, in March/April, and be on the wing in May. Click here for: a photo of an adult. The famous Dartmoor V-stones (as described in Dartmoor News, No. 93, Nov-Dec 2006) at SX 67543 81383 ± 4m. Several ideas as to their function have been suggested, from being anchor points for rope-spinning to pointing the way to the Warren House Inn. The link includes a suggestion that they may have been for mounting trucks onto the rails of a light tramway. Berni, Isobel and Liz passing by the V-stones. 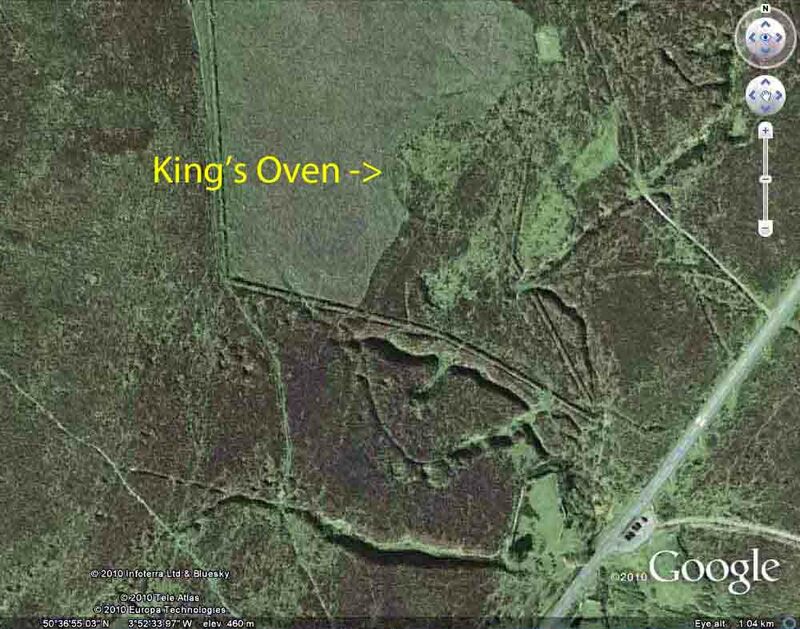 King's Oven - the precise location and nature of King's Oven is something of a mystery - the Legendary Dartmoor web site shows an image similar to the one above, saying that it may be the faint circular enclosure indicated in yellow. The King's Oven car park is visible towards the bottom right. King's Oven has been described in the past as being associated with smelting (tin) but there is no clear archaeological evidence for this. The name also applies to the cairn on the summit of Water Hill (see below). Zoomed view into the previous photograph. Hi-ho, hi-ho, its off to play we go ................ the sensible footprints have already gone back! Walking on the flank of Water Hill up to Hurston Ridge. Showing the proximity of Assycombe Hill and part of Fernworthy Forest. Another view of the walkers. Strollers at the row ..... part of the terminal cairn can be seen in the foreground. It was possibly here (?) that a stone axe and a cinerary urn (the latter upturned and covering a small heap of cremated bones on a flat stone, covered by a slab) were found in 1900 by the Dartmoor Exploration Committee. A photo of the restored Middle Bronze Age urn (1500-1000 BC) can be seen here (the larger of the vessels). The pattern around the rim is believed made by impressing the clay with a twisted cord. It was restored 1960-1962 and was put on display in the Plymouth Museum. According to Jeremy Butler, in the Dartmoor Atlas of Antiquities, Vol. 2, Page 31, Section 10: Hurston Ridge Cairn, the urn was found in a cairn on the west side of Assycombe Hill which is no longer marked on the latest 1:25000 map. Addendum: On 4th Dec, photographs of the urn found on Hurston Ridge were taken in Plymouth City Museum: HERE. The urn is about two feet in height, maybe more. The museum description says it is early Bronze Age, 2010-1500 BC. Then, back again, towards the Hurston "menhir". The row is described by Jeremy Buttler in Dartmoor Atlas of Antiquities, Vol 2, page 30, fig. 25.2 as being early Bronze Age (2700-1500 BC). Skating lessons are available - as long as the ice holds! The cairn on the summit of Water Hill ..... covering a prehistoric grave (unusual for Dartmoor). This served as boundary marker in the 1240 perambulation of knights when they mapped the king's hunting forest of Dartmoor. It was called Furnum Regis, King's Oven. Later, the name was used also for the old enclosure nearby (see the Google Earth image above). Showing four enclosures (marked by red flags) used by warreners: apparently the southern-most one was used for growing vegetables and the others were used for growing feed for the rabbits bred by the warreners for meat for the tinners. There were several mines in the vicinity and the Warren House Inn is another indication of activity. Grimspound enclosure, standing out in the snow, 2.86 km (1.8 miles) distant. Setting off, downhill, towards the Warren House Inn. Showing the dug-out entrance to the large cairn under the pile of rocks. This was roofed with galvanised iron and was used as a lookout, becoming known as Natty's Castle, for use possibly by a shepherd or rabbit warrener. A similar shelter was found on a previous walk, here: 2009-10-7 - Bennetts Cross. A dug-out trench following a tin lode, behind the Warren House Inn. Ice formed on the side of a stream across the road from the pub. 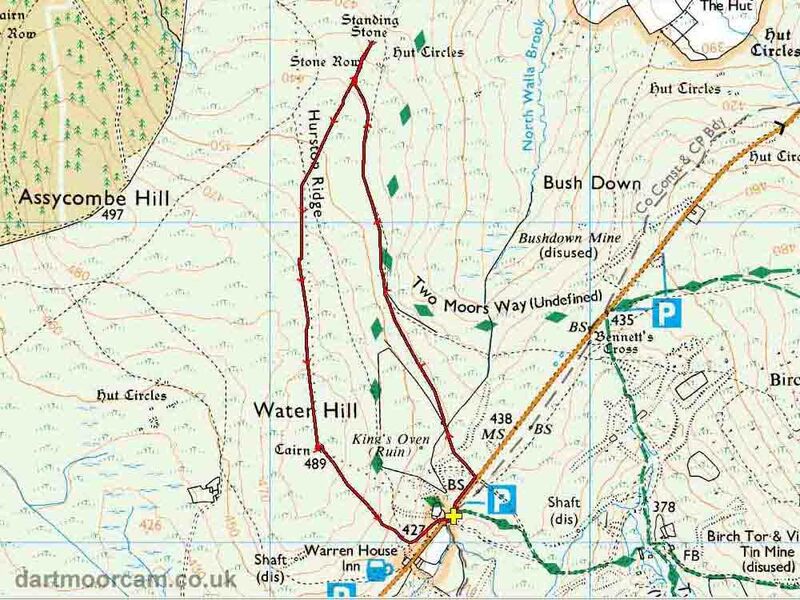 This walk was accessed very easily by following the B3212 from Two Bridges out through Postbridge and stopping just past the Warren House Inn, at a small car park beside the road on the right, marked by the P symbol and yellow cross on the map.